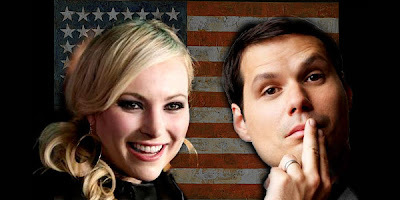 It has been a while since I have written about my favorite out of work comedian, Michael Ian Black...or more lovingly referred to as MIB. I just got caught up in my own little world and Your Daily MIB suffered greatly because of it. I am pleased to announce, that even without my support over the past number of months, MIB was able to land a book deal with a co-author...and an unlikely one at that. Former Presidential nominee John McCain's daughter, Meghan. The book is going to be called Stupid for America..."The pair will be touring the country this summer, talking to everyday Americans about politics, to find out why, as the publisher put it, the system is 'so f-ed up.'" I don't know much about Meghan, besides the fact that she is a republican and a blogger...but I know enough about MIB to know that it should have some good laughs. It is believed that they are planning for the book to drop during the election next year....ooooo good timing. Ha ha.